I had big plans. I really did. For the Olympics. No, no. I wasn't participating in a sport (although I might have made a big splash in diving or been hilarious on the pommel horse, or whatever they call it). I have been a fan of the Olympics since that year in the 80s when the Russians didn't come and the US won all the medals. Or was it the other way around? Either way, I lived on gold-medal Big Macs that summer. So I'm a fan. But I'm also deathly afraid of crowds. 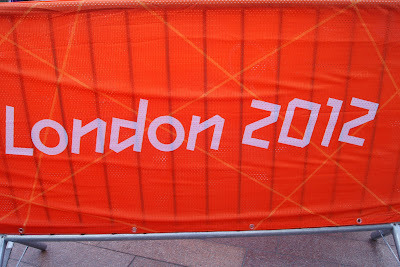 As we set out to Stratford on Friday to have a stroll around the Olympic Park, I was all jittery. Announcements in The Tube warned us that many stations would be "exceptionally" busy (read hordes of excited tourists touching me). The Tube was not full at all though. In fact, The Tube was not any more crowded than it ever is. Despite repeated warning the entire weekend, London was not crowded...ever. When we arrived at Stratford, the Olympic volunteers outnumbered the excited tourists. And we soon discovered why. 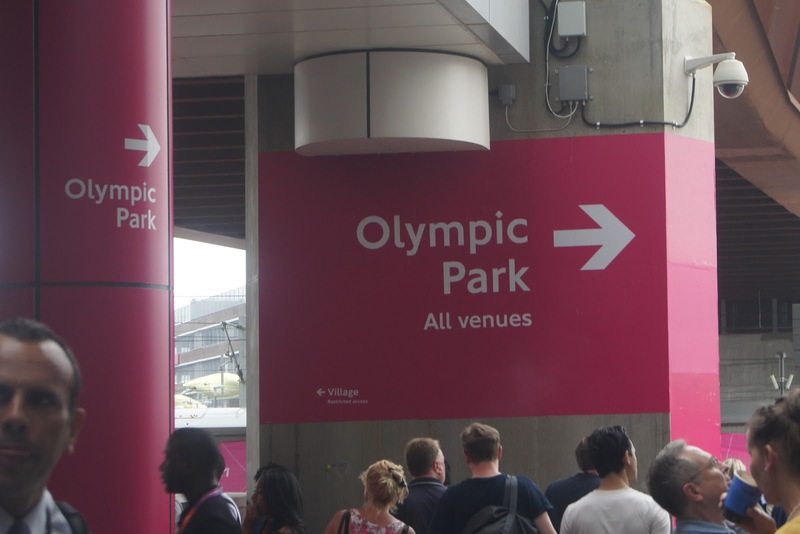 Apparently, unless we were given the wrong information (which is entirely possible), you have to have a ticket to an event to enter the Olympic park. I don't think we were being naive (although you know I have big dopey eyes). On the telly the day before, the presenters were talking about how wonderful it would be to take your family and watch the games on the public viewing screens at the Olympic park. At one point, a random woman who was being interviewed said, "Well, I think I'll come down here and have a nice day on the green." At which point the interviewer might have said, "Do you have a ticket to an event?" The poor woman (I feel and know her pain) would have said, "Of course I don't. Only dignitaries and clients of large corporations have those tickets!" And the interviewer would have said (as he slid his own ticket more snugly into his pocket), "I hear Curry's has new wide screens." And what have these dignitaries and these clients of large corporations done with their tickets? Nothing. Many of them didn't even show up. That's why you see an enormously embarrassing number of EMPTY SEATS, EMPTY SEATS, and more EMPTY SEATS. Here's another informative--albeit very poorly edited--post from The Telegraph that might help you get tickets. Here's what happened: To order a ticket, you needed to create an account and hope you'd get a ticket (months ago). I actually tried this but didn't get tickets. 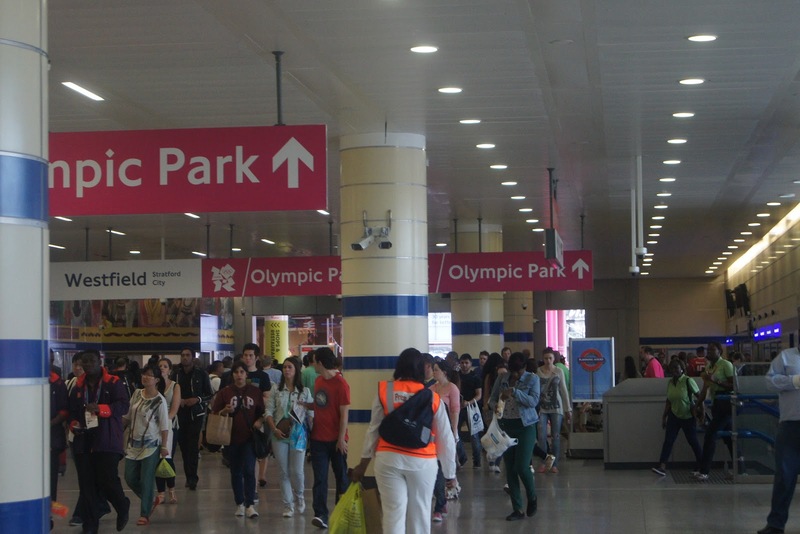 At the Olympic Park there is no way (unless countless people misinformed us) to purchase one of those empty seats; on site, there is no equipment facilitating that purchase. I'm sure this process was a security measure to ascertain the identify of the spectators, but even this doesn't make much sense if large corporations are buying the tickets and then giving them to someone else. Does it? Here's what should have happened: Yeah, sure. Let those dignitaries and large corporate sponsors have their tickets, but then also let the people who show up at the Olympic Park (who tried but couldn't get tickets) purchase the EMPTY SEATS when the VIPs don't show. There were hundreds of people begging to get in on Saturday. Strip search me if you want to (I'll make it worth your while! ), but why turn me and my money away? It would have been as easy as taking a form of ID at the door and returning it to the person at the EXIT, like some museums do with the audio guide. Then you know who I am, I get to wave my flag, and everyone is happy. And all of those volunteers just standing around and smiling--they are all so lovely, friendly and helpful (or helpless as the case may be)--would have something to actually do. Seriously, the number of people working the Games just about equals the pitiful number of people actually watching them at the venues. Don't get me wrong. I was happy. 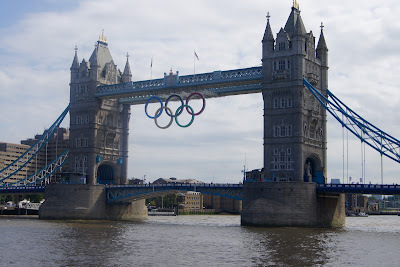 I watched as much of the games as I could in the public viewing areas around London. Every TV in every pub had the games on. I watched the men's synchronized diving on the huge monitors in the Duty Free Shop at Gatwick. 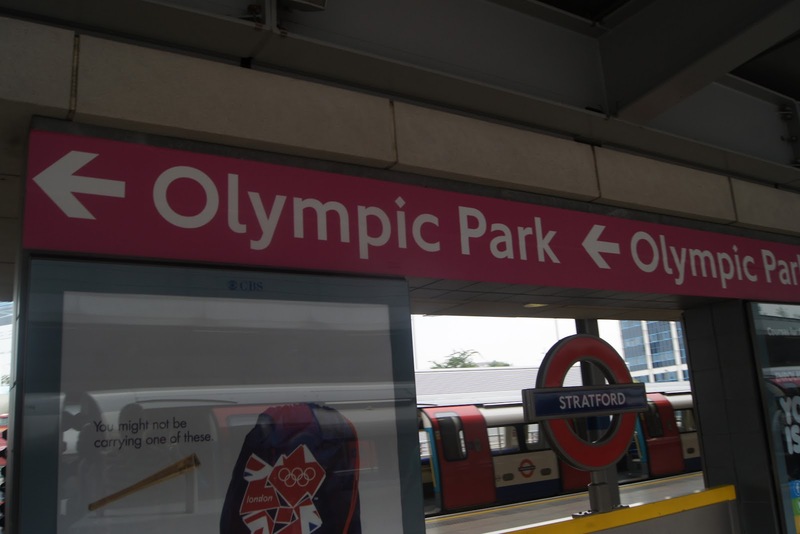 And how could anyone have found the Olympic park anyway? We searched everywhere but couldn't find one sign. 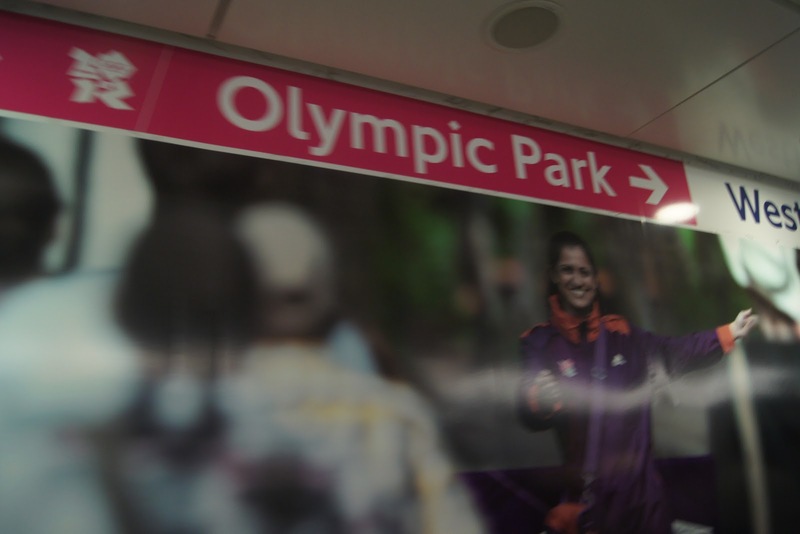 You'd think the organizers of the games would have thought to put up at least one sign showing people the way. How's a guy to find a sign to the Park around here? "Excuse me, sir. I can't find the Park." Just one sign. One. You'd think the organizers would have been clearer about where the Park is. Where oh where is the Park? This is going to sound like sour grapes (as it should), but I don't think the clients from those large corporate sponsors were able to see and understand the opening ceremony as well as I did. So much of it was dependent on seeing individual actors. From the stands I'm sure Kenneth Branagh looked like a tiny black Shakespearean speck against those fake green pastoral hills. The cameras always picked up individual stories going on in the show. Here peasants and working class sods deconstructing the countryside, there lords tipping their hats and doing dreadful choreography. If the spectators had to look at a screen to see this, well they could have stayed home. Yep, them grapes is sour. Not really, just kidding. 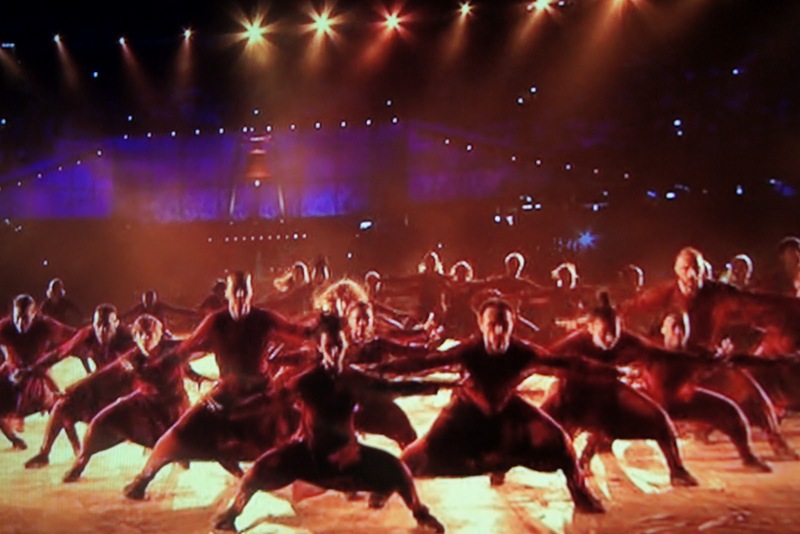 The best choreography of the evening. I think this might have been visible from the stands. 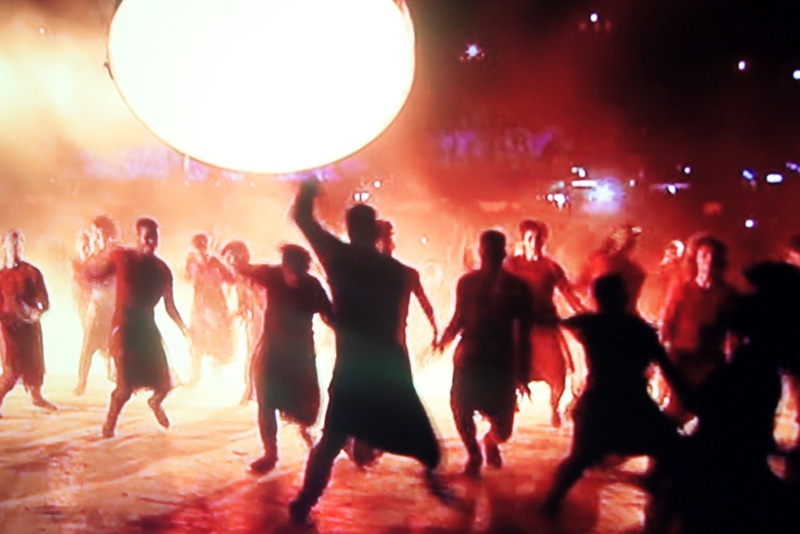 And what a wonderful idea for the opening ceremony: to cram the history of the British Isles into an hour. That is so creative. I can just hear the pitch from the director: "Yes, well, I thought it would be rather nice to do a sort of chronological swipe, as it were. Like Spamalot or Reduced Shakespeare. That sort of thing. For the clients of corporate sponsors, as it were. And Kenneth Branagh of course. I like the way he holds his mouth. Very Shakespeare, and all that." 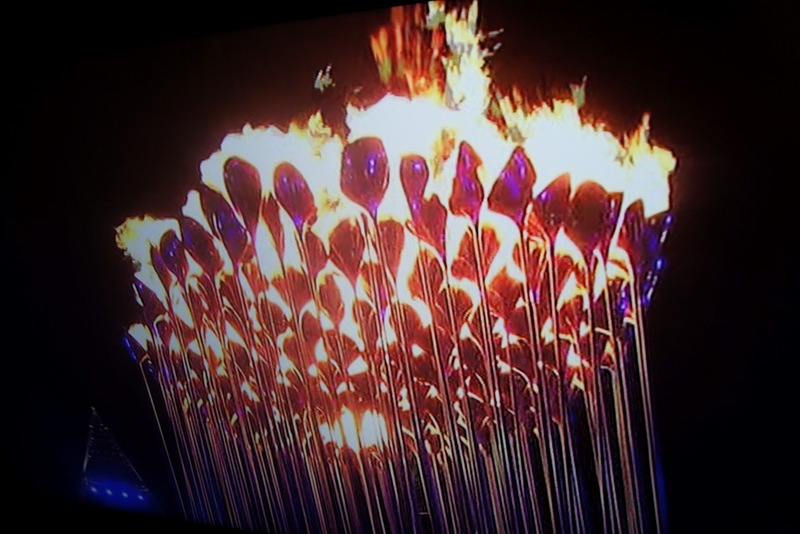 The cauldron was beautiful, though. I woke up three times during the opening ceremony: when the Queen made her acting debut (good on Her), when the young athletes lit the cauldron and when Paul McCartney sang "Hey Jude". I tried to stay awake while the teams were coming in. The last team I remember was the Russian Federation. I missed the US. Damn our alphabet. 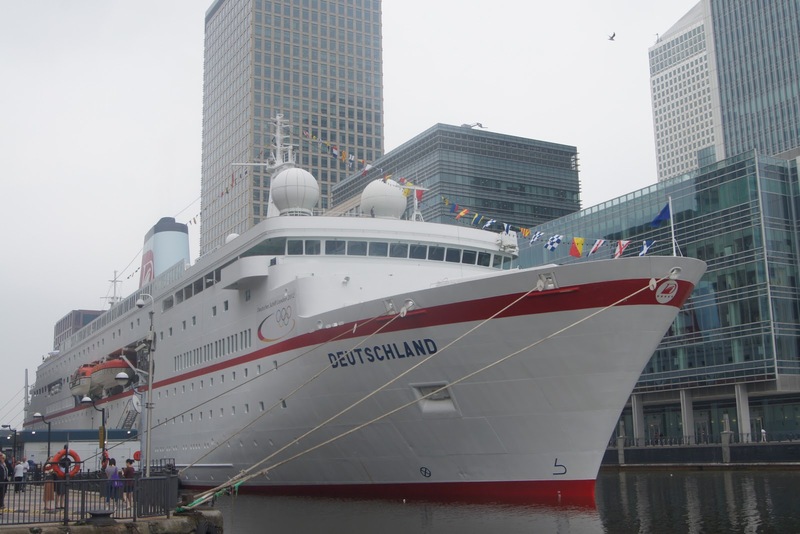 The German "Traumschiff" was anchored just around the corner from our flat in Canary Wharf. Apparently it is the largest ship ever allowed to anchor here and also apparently it's going to take the German athletes home to a hero's welcome. We got to see it every time we came home, but alas we were not allowed on board. An Olympic theme, I suppose. 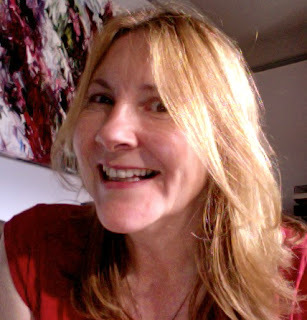 Hey, Tania! Yes, we actually politely confronted the volunteers about the issue. They were really nice but couldn't do anything to help us (or any of the other hundreds of people who would have paid lots for those seats). Luckily, there weren't any crowds--lucky only because of my fear of them. I'm ever so glad I didn't even dream about going. Like you, crowds terify me but quite apart from that, the Olympics have long ago lost the original idea of what they were all about. It's a giant money making machine and if, like this time, the money making fails and they have to fill VIP seats with soldiers, I can only gleefully giggle. Hi, Inka! Yes, I'm glad the soldiers and the school children got some of the seats--but obviously they didn't get enough of them to cover up the fact that thousands--and I'm talking thousands and thousands--of seats are still empty. The organizers have come under pressure to open up these seats to the public, but it's too late for me. I'm back in Munich now. You didn't wake up for Mr. Bean? Best part of the ceremony! 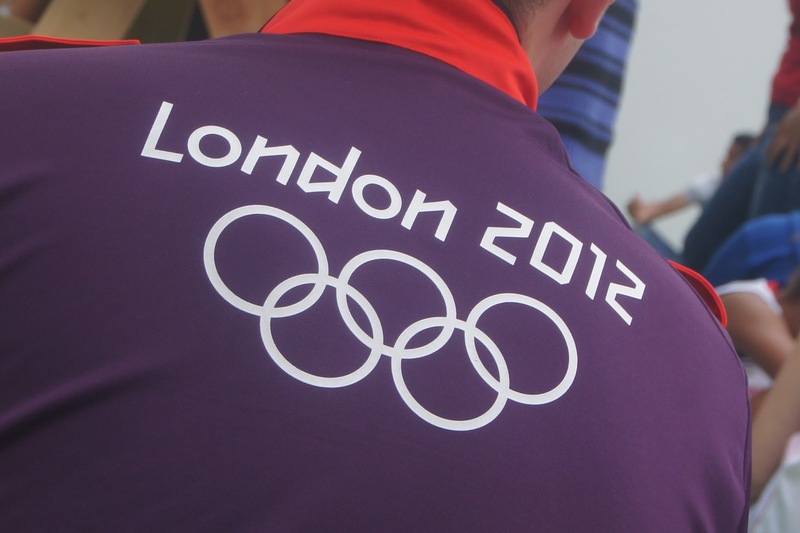 I was at the Opening Ceremony; spectators did have screens to watch the action. There were two large ones at the top of the stadium, they probably weren't seen much in the broadcast of the show. And just to clarify, those empty seats are not corporate seats. 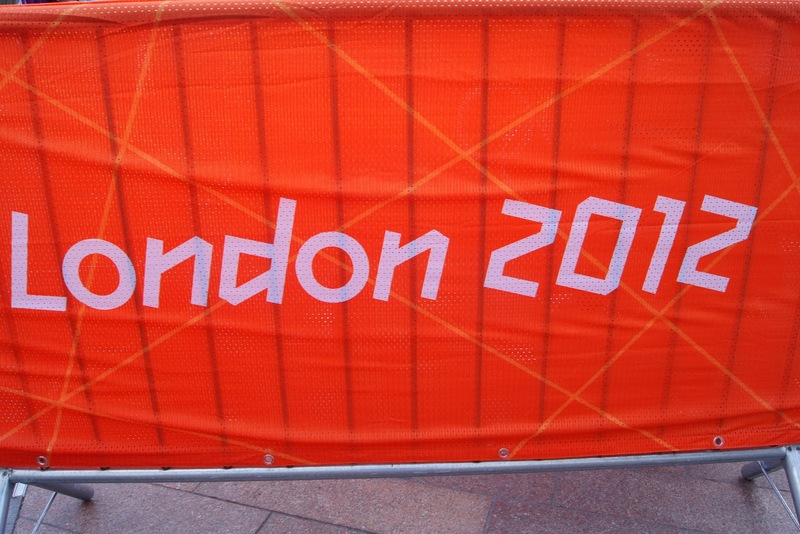 They are accredited seats -- for journalists, photographers, friends and family of athletes. They are not VIP or company seats. Glad you were able to enjoy some of the Olympics though! All of the articles that I read indicated that the empty seats at the qualifying events had been bought by dignitaries and corporate sponsors, but I can imagine that some of them were also for family, journalists and other athletes. The problem, though, is the same: empty seats with hundreds of disappointed fans who couldn't get tickets.